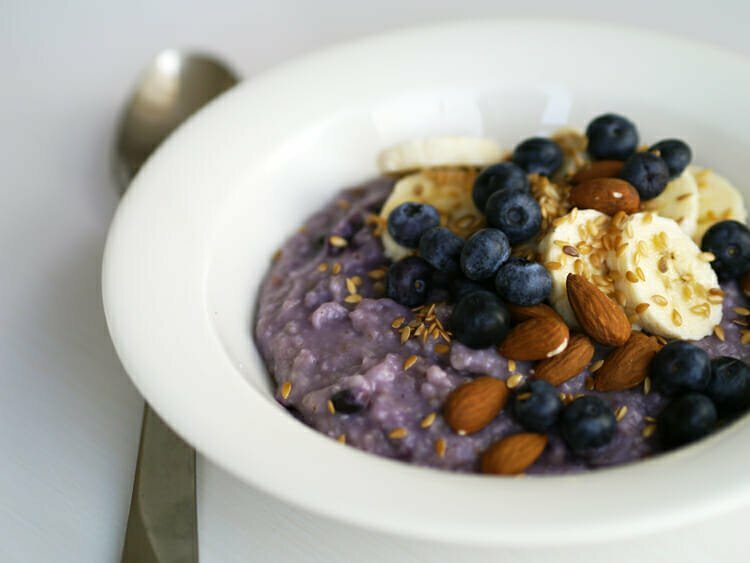 Ever thought about cooking your berries into your porridge? Some mornings, we just yearn for porridge with a difference. This porridge was one we tested last week and it may well make its way onto the menu in the future. Change the toppings as you see fit - we love banana and blueberry, so we went for that, but you can do this with raspberry, too. As for the seed and nuts, hazelnuts go well - and we also made it with chia seeds, as some of us are really into chia and all the benefits that go with those. It's a super lovely porridge - do give it a try. We added a drizzle of honey, too. In a saucepan, add the oats, half of the blueberries and the water and salt. Bring to the boil and simmer for 4-5 minutes. Once the berries have cooked through, mash them gently with a fork to let the juice out to colour the porridge. Serve piping hot in a bowl, top with 1/2 banana per portion, the remaining blueberries as well as a small handful of chopped almonds and linseeds. We added a drizzle of honey, too. By the way, if you happen to pass by the cafe for your morning porridge, we support a great charity called Magic Breakfast that provides breakfasts for young kids at schools in the UK. One in three children in the UK go to school hungry – and how can you learn on an empty tummy? So, Magic Breakfast go in and help out where the need is greatest. ScandiKitchen donates one whole breakfast for a child EVERY time you buy a porridge at our place. So, suddenly, your porridge is double good for you. And someone else, too.